WWSD: What Would Saraswati Do? Saraswati is a goddess of wisdom, learning, education, and the arts. As such, it’s fairly self evident that academic and scholastic pursuits fall under her purview. In my opinion this is why she was not only adopted by Buddhists, but has remained very popular. There amid a celestial gathering of youthful musicians. Compassionate goddess, come here now! There before me in a pose of seductive dance. Grant me, Saraswati, your power of speech! Make our speech as one. I bow before the goddess Saraswati. Saraswati was explicitly stated in Buddhist scripture (specifically The Sutra of Golden Light) to grant eloquence and enhanced memory to monks. Given the increasing intricacies of Mahayana theology and the highly competitive nature of religious scholasticism in Tibet and India from the time of the Buddha onward, those who sought Saraswati’s blessings did so gladly. Saraswati pressed this rhyme into my brain as I struggled with how to begin. Have you ever heard of the Ganges? Well, once upon a time (mukashi, mukashi…She reminds me) it wasn’t Lady Ganga but Saraswati who was the most sacred river in all of India. She was called “seven-sistered” and said to be foremost of the seven holy rivers of the Vedas. Yet if you seek her waters today, you will be disappointed; they vanished centuries ago. I was married to the Grandfather once, the creator god Brahma. (He’s called the Grandfather, in case you didn’t know). Now, the Grandfather is…well, I’ll let you figure that out. One day, a very, very long time ago, The Grandfather was going to hold a fire ritual. He needed my presence at this oh-so-important ritual, because I am his wife, and his ritual partner. He was a very silly man, don’t you think, to require my presence when I had better things to do? Anyway, I was getting ready (I had to look my best for this oh-so-important fire ritual). The silly little man kept sending messengers to fetch me, even though I had plenty of time. Silly little man! I sent them away. “I will be on time,” I told them to say. “Do not start without me.” But of course, Grandfather didn’t listen (did he ever?). Needless to say, I was not happy when I arrived. The new “wife” was a milkmaid his men had dragged into the whole affair. The poor dear was quite petrified, and in any case had no idea what to do at this oh-so-stupid farce. All the gods were there, even Shiva and Vishnu. Their wives, I could see, had taken their time and hadn’t been made to rush! Oh my, I was quite annoyed. And there was my dear husband, looking quite the fool with this poor milkmaid girl half his age and twice his beauty. She was not terribly unlike me, I must admit. “I came on time,” I reminded him. And as I looked over the assembly, my eyes landed on the milkmaid. Her face was red and her eyes were bloodshot. When she saw me, she hid her face and began to shake with fear. Oh, that was what angered me! The poor child had not asked to be dragged into this. “It’s not important, Your Ladyship,” she whispered. Shiva and Vishnu were both at this point doubled over with laughter. It was such as shame really. I was going to have to be the one to ruin my husband’s oh-so-serious ceremony of a farce. She looked up at me, tears pouring down her face as I enveloped her with my energy. As her fear melted away, she looked over at the Grandfather. There was fire in her eyes enough to make Shiva himself stop with his laughter. “That makes two of us,” I said, as my gaze too fell upon Grandfather. “ENOUGH!” And Vishnu fell back. “No one will worship you ever again.” And I knew my words to be true. “And you!” I said, turning on Shiva. “Your austerities will in the end mean nothing. You will have a wife and love her more than yourself, and you will lose her and grieve for her like a mortal man.” And I knew my words to be true. “…and you!” Now it was Vishnu’s turn “You will be made to leave the heavens and walk as a mortal. You will suffer as a mortal. You will die as a mortal.” And I knew my words to be true. And my words were true. Objective Fact and Subjective Truth: What’s in a Name? Contemporary Hindu sources, give the etymology of her name as “Sara” and “Sva,” that is, the knowledge of one’s self or essence. A very pretty explanation too, but not one I find useful, as I am already far too prone to self-absorbed navel-gazing. I’d make a very good Pythia, as I “know myself” perhaps a little too well. What does Sarasvati’s name actually mean, though? For a start, Herself was originally the genius loci of the mysterious Sarasvati River in Ancient India. She was a Vedic deity, and as such, was not anthropomorphized except as poetically necessary. She was the river, spoken of as gushing in mighty torrents that broke the peaks of mountains. In the Rig Veda one is more likely to hear talk of Sarasvati’s roaring waters than anything else. She was not conceived of as a beautiful goddess, but as the awesome waters of the river. The meaning of Sarasvati’s name is thus the meaning of the river’s name. In an unusually richly cited and clearly reliable article, Wikipedia details the etymology of the River’s name. In the proto-Indo-Iranian languages of Ancient India and the Near East, *sáras-va-tī meant “marshy” or “full of pools.” In later Sanskrit, the masculine sáras meant “pool” or “pond,” while the feminine sárasī meant specifically a stagnant pool or a swamp. A connection with the Sanskrit *sar-, or “flow, to run” is specifically singled out as being unlikely. Thus, the river’s name was likely a description of the terrain of the area: marshy, a swamp, full of stagnant pools. But here we come to the distinction I posited in the title of this post: Objective Fact and Subjective Truth. The facts are that Sarasvati’s name means “marshy, full of pools,” and refers to her origins as the genius loci of the Sarasvati River. One cannot dispute that her name did not originally mean “knowledge of self” or “the flowing one.” That was simply not what it meant in Vedic times. The Sarasvati River was not named for either of those things, and thus, neither was my goddess. Those are the plain, bone dry facts. However, facts are in the domain of rationality and measurable, verifiable experience. Once you leave the realm of objectively verifiable, materialistic facts that are required in the social and natural sciences (and to a lesser extent, in the humanities), you stumble into experiences that simply require a different framework for evaluation. There is a reason that individual, mystical experiences have their own acronym in the Pagan community (UPG – unverified/unverifiable personal gnosis). The sublime and the numinous comes to each person differently, if it comes at all. In fact, the experience of the sublime is usually considered to be unique to the individual, simply as a given. This is why, in the pagan community, SPG (Shared Personal Gnosis, also called PCPG, or Peer-Corroborated Personal Gnosis) is often such an incredibly validating experience. For example, I stumbled across a poster on a Pagan forum who worked with Sarasvati. This person claimed that Herself had a thing for being surrounded by crystals. I promptly freaked out, as this is something I could verify in my own personal experience with Her: Sarasvati loves crystals and stones. 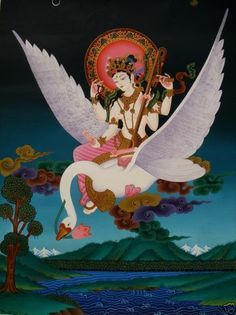 So what does this have to do with the meaning of the name “Sarasvati?” Well, it all comes down to the idea of there being a concept of subjective Truth, as well as the more ordinary, rational truth (with a lowercase-t) shown to us by facts. Myth is often held up as an example of Truth rather than truth. The ancient stories of deities reveal Truth (with an uppercase-T) about Them that the academic texts do not. To a Hellene, the objective reality of Greek myths is irrelevant, because the myths speak to the sublime. They reveal reality on a different level than the material. So may your god bless you, whichever one that is.